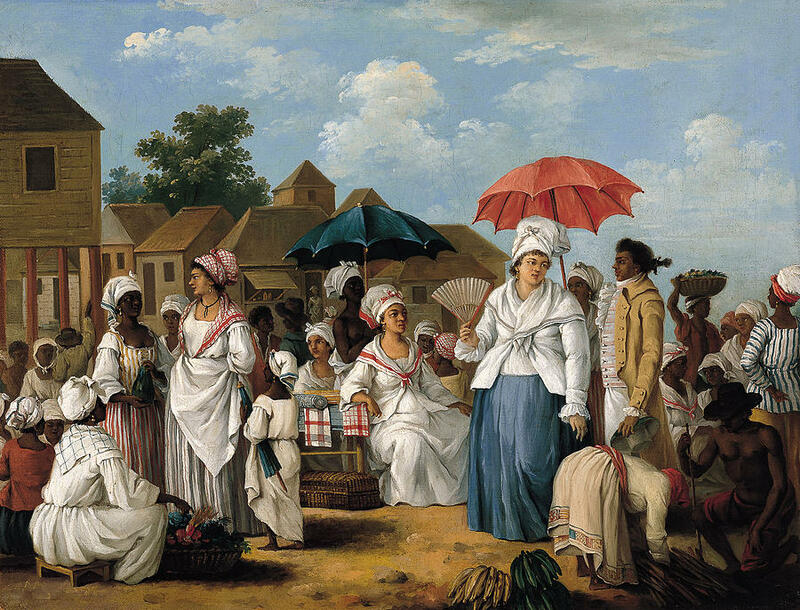 His paintings are nowadays viewed as artistically complex visual documents showing European imperial history, but in his time Agostino Brunias (1730-1796) was considered to be subversive for showing interaction between the West Indian natives and the wealthy colonial. Agostino Brunias was born in Italy and moved to London in 1758, where he became a respectable mural painter of stately homes. In 1770, at the height of his career, he left London to settle in Dominica, then one of the newest West Indian colonies of Britain. 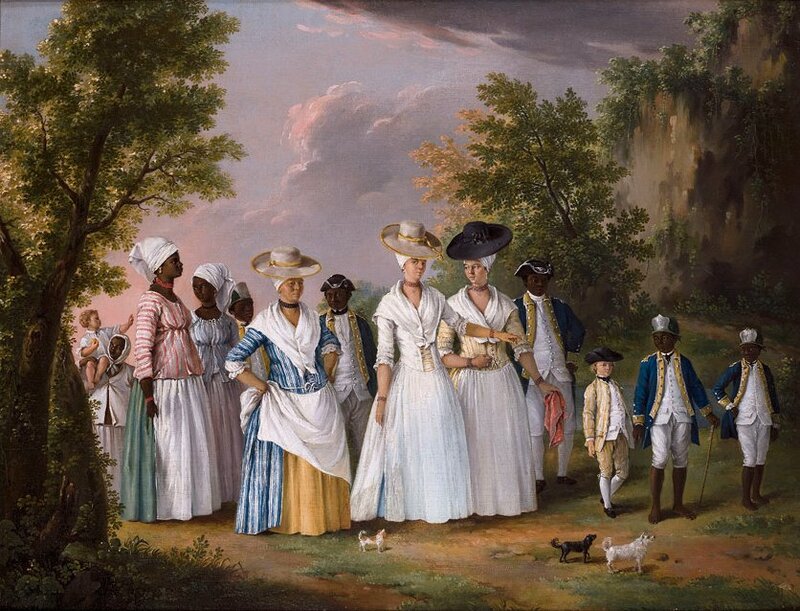 Initially commissioned to depict the upper-class plantation life, Brunias soon started to use the forested mountains and rivers of the West Indies as background for paintings of the people around him, who in most cases were colored. He presented a romanticized image of the colonized regions, showing interaction between the natives and the wealthy colonial settlers, while obscuring the realities of plantation slavery. For a long time Brunias’ work was deemed valuable only for the classical qualities and elegant poise of his figures. Since the 1980-ties however, his paintings are considered to accurately relate the hierarchy of colonial Caribbean, in a way illustrating the history of slavery. The main reason for this change in evaluation are the magnificent detailed textiles worn by Brunias’ subjects. Not only do they correspond with many firsthand European accounts, they also articulate the hierarchy of colonial civilizations. Denim is for field slaves, while extravagant materials and colors are worn by freed slaves, mulattoes and the well-to-do whites. 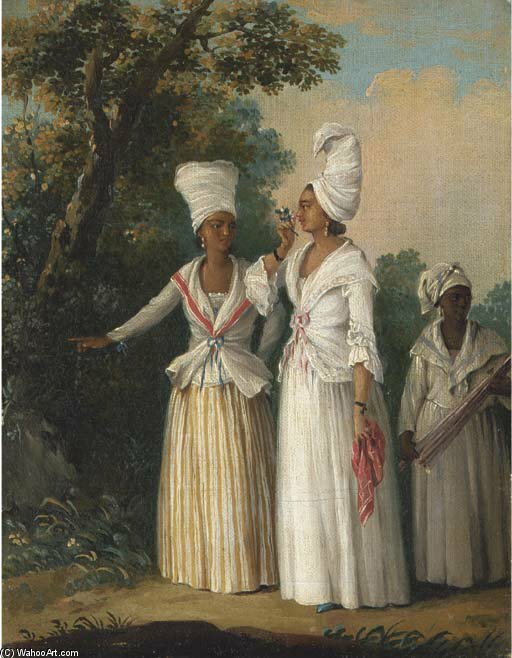 What you wear in a Brunias painting determines your place in Colonial society. 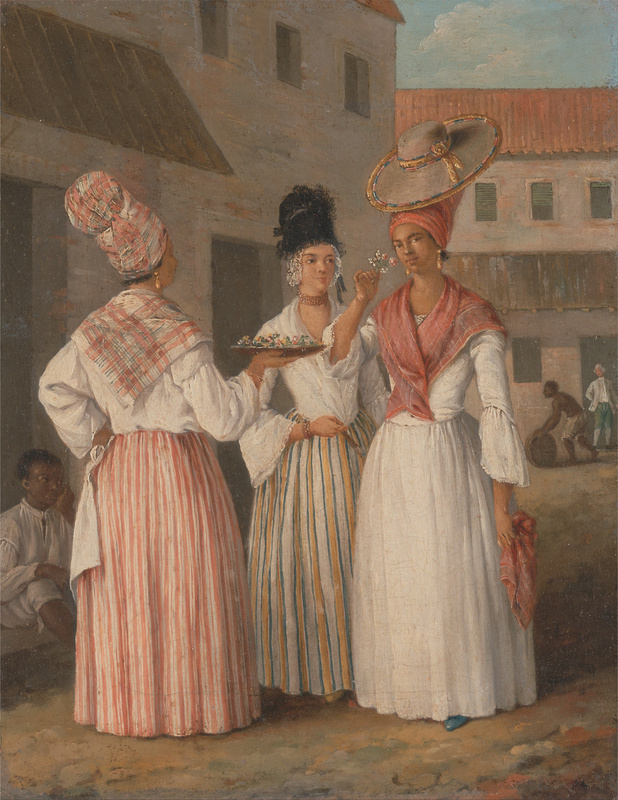 The only exception seems to be the head wrap, which is worn by nearly all women regardless of race or social status, suggesting a Creole fashion style. Examples of Agostino Brunias paintings can be found in private collections and at the British Museum; The Yale Center for British Art; Harvard University; The National Gallery of Jamaica, Kingston; The Brooklyn Museum of Art and The Museo Thyssen-Bornemisza, Madrid.